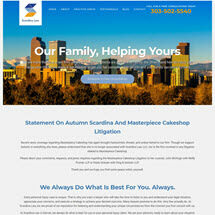 Scardina Law is a Denver-based law firm representing individuals and businesses throughout Colorado in a wide range of legal matters. Founded by brother and sister attorney team, Autumn and Todd Scardina, we understand the importance of family. Our lawyers bring decades of combined experience to family law, personal injury, insurance disputes, construction defects, business disputes, employment disputes and more. Regardless of the legal situation that you have been confronted with, we are prepared to guide you through it. Let our family help yours today. Our experience and willingness to fight to achieve positive outcomes in even the most complex cases is supported by our commitment to personal attention. We believe that you should feel comfortable with your legal representative. You should feel like your attorney is there for you when needed. You want someone who will stand by your side, and we will. We provide every case with the personal attention necessary to succeed. Every case we handle begins with a free consultation. Whether you are going through a divorce, face another family law challenge or have any other legal issue to overcome, we encourage you to get in touch with our Denver lawyers to find out how we can help.